The Twin Cities German Immersion School (TCGIS) is a charter elementary school that values high academic achievement and engages each individual child through an enriched second language curriculum taught in German. With the support of parents, our school creates a community that nurtures a child’s natural curiosity and fosters international awareness. Instruction at TCGIS includes math, German language arts (reading, writing, spelling, phonics, literature), science, social studies, character development and physical education on a daily basis, with world cultures integrated throughout the curriculum. All children have rotating weekly opportunities to experience vocal & instrumental music, visual arts, drama, and choreographed movement. At four different points during the year, weeklong blocks of special cultural projects are offered. For children who are not yet reading, initial literacy occurs in German. Formal reading instruction in German is introduced in first grade, and English Language Arts will be added in third grade. Instruction in English and German will be clearly separated by language. By middle school, instruction in English will be expanded into additional subject areas, while German will be maintained for the majority of the day. The addition of a third language is planned for the middle school level as well. TCGIS implements best practices for elementary students and methodologies most appropriate to our unique instructional model. The daily routine includes morning meeting with guided social interaction and introduction of learning themes, direct instruction with the whole class, small-group instruction, and academic choice time. Small-group instruction provides peer interaction for thematic work with teacher supervision, as well as ability grouping in math and language arts. Differentiated instruction enables those students who need more hands-on guidance to practice basic skills, while those who have already mastered the current concepts can work on more challenging activities at a higher cognitive level. Native German-speaking interns, as well as parent and community volunteers, are used extensively to enable small-group learning. TCGIS has a dual academic focus: a thorough understanding of basic concepts and mastery of a specified body of knowledge within each subject area. This combined approach enables children to apply what they have learned in real-life situations. 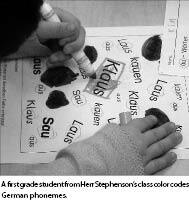 TCGIS is committed to teaching children to be communicative in German in social contexts as well as in academic ones. The development of a respectful, caring community in which all children feel valued and in which making mistakes is an accepted part of the learning process is a primary goal. Language development is fostered through our thematically integrated curriculum. Our textbook series from Germany presents basic concepts in science, health, social studies, and language arts through coordinated thematic units. This means that vocabulary introduced in one subject is further reinforced in others, decreasing the bulk of words students need to understand and increasing the time spent practicing the new language. Teacher-generated stories incorporating new vocabulary also accompany each unit, giving children an opportunity to further internalize the language through retelling of the stories and corresponding role-play activities. Instruction in all subject areas occurs entirely in German, and children are encouraged to use German as much as possible. English-language responses from children are acknowledged, but teachers redirect the conversation with a German response. In the early months, English is used with children on an individual basis to clarify health or safety issues, but by January of first grade, the expectation is that all children will speak only in German. Total Physical Response/Storytelling: comprehension is demonstrated by physically responding to commands and spontaneously creating stories to retell. Fine arts are fully integrated with the themes and content of the core instructional program. Our music curriculum is based on internationally recognized philosophies (Orff Schulwerk and Kodály, see sidebar on p. 13) emphasizing early exposure to music theory and personal creativity through song, instruments, and dance. In visual arts instruction, children are exposed to a wide range of artistic media and international artists, with many opportunities to develop creativity through individual choices within each theme. Culture is taught both directly and indirectly at TCGIS. Core curriculum is presented primarily through authentic German textbooks and materials, and daily interaction with native speakers. Cultural celebrations and practices of many different countries are explored throughout the year, with special emphasis on those that are celebrated by members of our school community. Authentic German cultural items are displayed throughout the school, and classrooms provide a rich learning environment. Students and their families are encouraged to participate in culturally authentic events and festivals organized by the TCGIS and our sponsoring organization, the Germanic-American Institute (GAI). Before- and after-school care in a German-speaking environment, including additional half-day care for kindergartners, is also available within our school building on a fee basis through the GAI. The GAI also founded the Kinderstube German Immersion Preschool, which is currently operating at two sites and attracting an ever-growing clientele, many of whom will attend TCGIS in future years. Initial testing establishes baselines for reading, math, and German proficiency when children enter TCGIS. Academic progress is monitored on a daily basis at the classroom level and at the end of every unit for each grade level, and portfolio assessment includes ongoing selections of student work and teacher narratives. TCGIS will participate in all required state testing, and adheres to national No Child Left Behind guidelines. Language assessments will also be administered to evaluate proficiency development in German. For example, at program entry students will take the Early Language Listening and Oral Proficiency Assessment (ELLOPA) developed by the Center for Applied Linguistics (CAL), and in the primary grades CAL’s Student Oral Proficiency Assessment (SOPA). In the upper elementary grades, Kompetenz in Deutsch (KiD), a language assessment tool published by Österreichisches Sprachdiplom Deutsch (ÖSD) in Austria will be given. Without parent and community involvement, TCGIS would not exist. Our sponsor, the Germanic-American Institute, is a local non-profit organization with over 1,450 members dedicated to the promotion and enjoyment of Germanic culture and language. Parents and community members serve on our board of directors, volunteer in the classroom, raise money for the school and have been a driving force behind the founding of TCGIS. TCGIS is fortunate to have already accumulated a large collection of German language books. We are also the recipients of a generous Walton Family Foundation grant. A major portion of the grant is dedicated to expanding our library collection and providing audio recordings and summary translations of books so non-German-speaking parents can enjoy the stories along with their children. A collection of German language videos and DVDs is another planned component that has already been partially realized. TCGIS is dedicated to outreach to diverse communities. All children benefit from being challenged by an interesting and stimulating curriculum, and the advantages of bilingualism should not be confined to upper middle-class students. Children from lower income families are most in need of an enriched education, and children who enter school with a deficit in language are those who are most in need of an enriched language curriculum. TCGIS seeks to become a resource to parents by offering educational opportunities in German language and culture, child development, and supporting second language instruction. This is especially important for parents who are not proficient German speakers. As the school matures, we hope to provide more opportunities for family immersion in Germanic culture, participation in local cultural events, and relationship building with schools and families in Germany. A curriculum framework has been developed for TCGIS that clearly identifies the learning standards in all subject areas for both Minnesota and the German state of Baden-Württemberg, systematically embeds them into the curriculum, and articulates them across grade levels. All subject areas at TCGIS are integrated into cross-curricular themes to further reinforce basic concepts, and a multi-sensory approach implementing project-based experiences and hands-on learning activities accommodates all learning styles. Through fine arts instruction, concepts learned in the classroom are further reinforced, and children have the opportunity to explore academic themes more creatively and use language in a very holistic manner. Staff development and support are essential to TCGIS’s success. Teachers receive extensive training in backwards curriculum design, core principles of immersion education, Responsive Classroom philosophy, TPR/TPRS, and integration of German language skills into thematic units. All teachers receive a weekly block of joint planning time (in addition to regular prep time), under the guidance of the curriculum director, during which curricular innovations, instructional techniques, and cultural and linguistic issues are discussed.